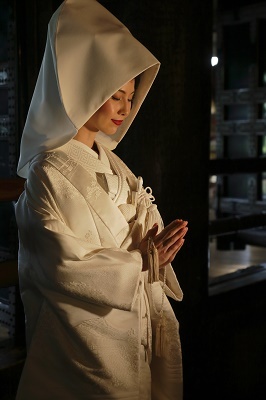 This Shiromuku (all white kimono) is made of the top-class “kara-ori” brocade. The woven patterns are designed with “Otowa-no-taki (water fall)” which is the origin of the temple, famous “Kiyomizu-no-butai (stage)”, “Koyasu-no-toh (tower)” which is believed to bring safe and easy delivery, and the pure spring water flowing through these motives with cherry blossoms and Japanese maple leaves scattered around. We started rental service of original wedding costume for Kiyomizu-dera Temple wedding. It took us so much work and hours to create the costume, but we could carry out the task believing that we were helping to preserve the old techniques. We would like to show the people how wonderful the traditional Kyoto style wedding is. Also we produced the brochure “Matofu” to introduce the magnificence of the wedding at the World Heritage Sites; Kiyomizu-dera Temple, Kamigamo Shrine and Nijo Castle, and the wedding costume. For the details, please visit here.